Select Marine Corps Caps 50% off. Get them while they last. General Marine Corps caps include: Veteran, Combat Veteran, Retired, Rifle Expert, Pistol Expert, Once a Marine Always a Marine, Best Friend Worst Enemy. Location caps include: San Diego, Camp Lejeune, Quantico, MCAS Beaufort and Camp Geiger. Campaign caps include: Afghanistan, Iraqi Freedom, Desert Storm, and Beirut. 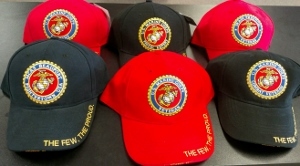 Specialty caps include: Marine Mustang, Citadel Marine and Montford Point Marine.